Three days after Hafwen was turned to ash, the rats invaded Southarp. They started at the Burnt Moon Mill, spilling up and out from a hole in the cellar floor, climbing walls and clinging to the ceiling. They quickly spread through the town until the streets seemed an undulating carpet of dark fur. The good citizens could not move but that they put a foot down upon a squeaking, protesting rodent. But that was three days after, three days after the fagots and sticks were lit beneath the giddy-headed girl, then fanned until the larger branches and logs caught. Until the flames flicked and licked at her toes, the soles of her feet; then they engulfed the ankles, calves, knees, thighs, the belly so recently flattened, up, up, the stomach, the breasts, the shoulders, neck and finally the head with all its lovely golden hair. And Hafwen, fair summer, was gone, cindered and sundered. But that’s by the by. The story doesn’t start there, not with the rats, nor even with poor foolish Hafwen’s incineration. The story begins a whole week before the funeral pyre was sparked. The story begins, as all good tales do, in a tavern, with two monks and a fox, a kilderkin of mead and a wager. 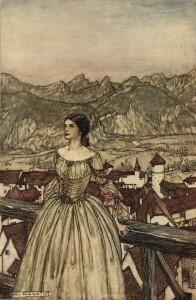 This entry was posted in fairy tales, News and tagged angela slatter, arthur rackham, bertalda, the bitterwood bible and other recountings, the burnt moon, undine. Bookmark the permalink.